The ongoing assault on U.S. Immigration and Customs Enforcement is truly unhinged from reality. As one pundit observed of the Left’s latest open-borders crusade: There’s more outrage over ICE than ISIS. Data – and the lack of it – tell a far different story than the screamers in the streets. Just as the Abolish-ICE crowd conveniently glosses over Barack Obama’s migrant detention centers, they ignore the most recently reported deportation numbers. In fiscal year 2017 (which included four months of the Obama administration), ICE deported 226,119 people, fewer than the previous year’s 240,255. In fiscal 2012, Obama’s ICE agents deported 409,849 (still less than 4 percent of the estimated 12 million illegal aliens in this country). Under Trump, ICE deportations are trending down, not up. That certainly cannot be due to a diminishing number of deportable individuals. Then there are the detainers, which ICE uses to hold suspected criminal aliens in local jails. Since these detainers are merely requests, sanctuary cities across the country can and (thanks to meddling by lower courts) do reject them with impunity. Local resistance notwithstanding, here’s another blow to the ICE-as-Gestapo narrative: Detainer requests are down, too. Through April 2018, ICE was issuing an average of 14,000 new detainers each month. That’s far below the peak levels under Obama, when more than 20,000 detainers were prepared monthly. Transactional Records Access Clearinghouse (TRAC), a nonpartisan research center at Syracuse University. As ICE agents run up against new impediments daily — Philadelphia last month scrapped its agreement to notify ICE of felony and misdemeanor arrests made by city police – the agency isn’t helping itself by withholding relevant data that is public record. 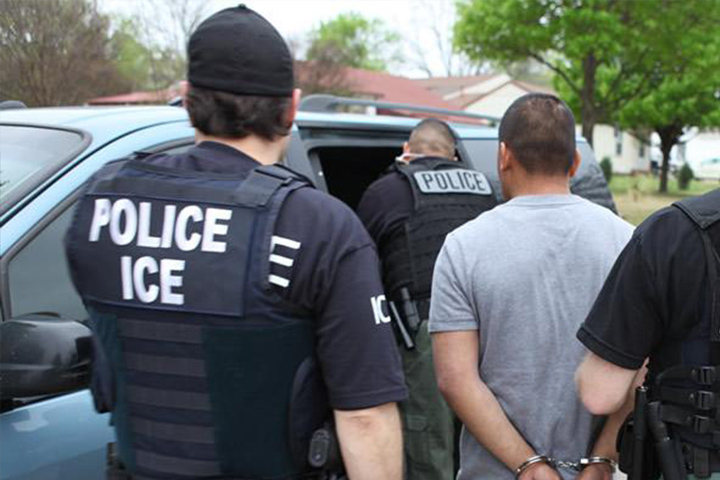 Far from looking like a tough immigration-enforcement agency, is ICE melting under pressure? Paging Mr. Trump. Eisenhower and Kennedy both placed national guard troops under federal control to enforce integration in southern schools. What would be the difference in sending troops to enforce the law in sanctuary cities like Portland and Philadelphia where social justice warriors are violating the rights of both civilians and federal workers. We have pockets in this country where mob rule is in effect and city officials do nothing. If they refuse to enforce the law equally then someone has to do it. There is also the fact that when right wing groups get a permit to protest, and as cringe worthy as some of them are, they have the right to do so, but counter protestors show up and incite violence. Frequently the cops fail to keep them apart or even cancel the permit. Supposedly this was all settled years ago. There is a right to protest, like what they say or not. There is no right to show up wearing masks and attack other people, but it happens all the time, and the cops in effect hold the coats of the attackers. August also brings the annual liberal rewrite of history. It goes like this: poor innocent little Japan had been trying to “surrender for months” but mean old Truman just dropped a bomb on them anyway. Except all the documents from both sides show they wanted a ceasefire in place, keeping all the land they held at the time. Even after the second bomb, they were making the demand that the emperor would still be the supreme authority in Japan and all the powers that ensued, something we were never going to accept. The emperor said that the bomb was the reason they surrendered unconditionally. Take his word or all the revisionists.